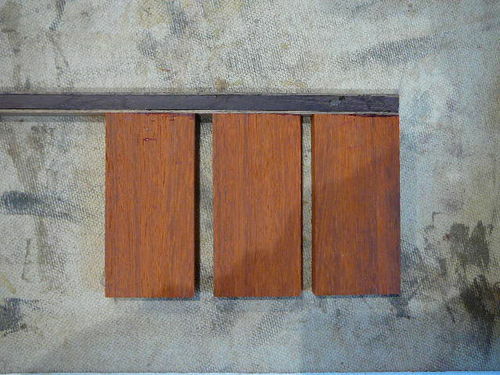 The initial blocks start out with only a few strips of wood with spacers between them and they look pretty rough. However, as the blocks are completed and glued to other blocks, the design starts to come together. 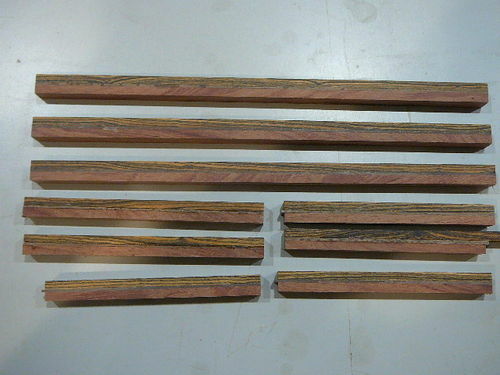 Initial strips of bocote and bubinga with walnut spacers. 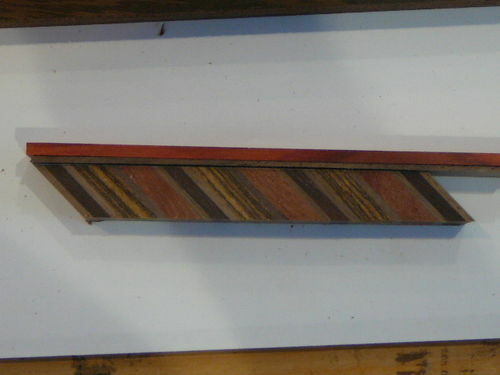 Initially, the design was for this section to run vertically but cutting the pieces on a diagonal changed the grain of the piece and looked better overall. 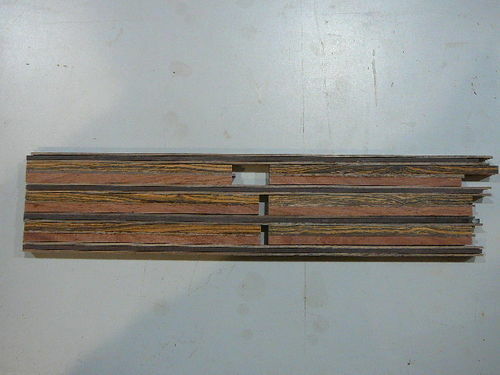 This is another reason not to cut too many pieces before checking the fit and look of the first set. 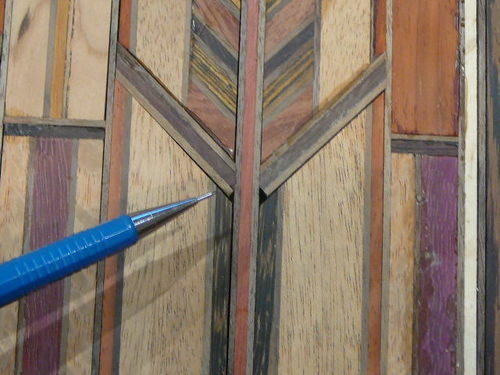 Throughout the process of cutting, gluing and assembling the mosaic there were several changes that were significantly deviations from the initial scale drawing. It meant that I had to check dimensions on nearly every piece but using the idea of making smaller blocks that could be trimmed to fit made the process less time consuming and also helped with the fit. Keeping things square and tight also made it easier to fit the changes consistently. It is a slow, tedious process. 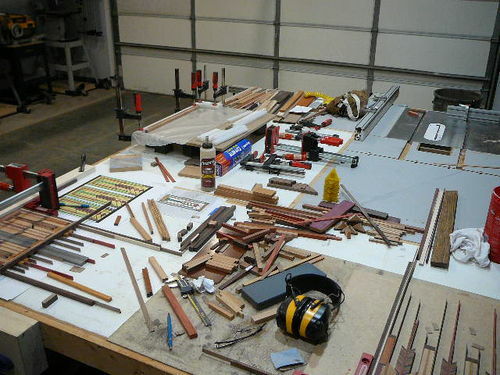 As you can see, it takes a lot of space on the work bench. Working from the bottom and one side also helped keep things square. 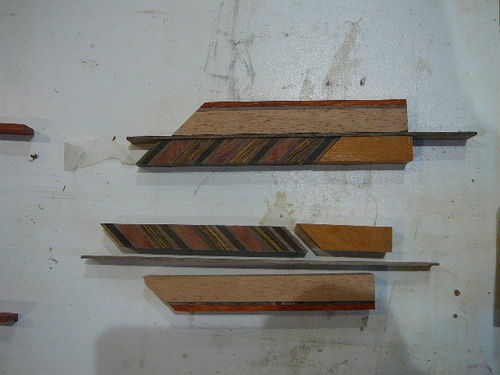 Rather than glue everything together, I made panels of the components between the wider vertical strips and the diagonal transition. They were large enough to move around easily without disturbing all of the small pieces. Since there were still pieces that hadn’t been finalized I didn’t want to make the panels too big in case something needed to be changed. 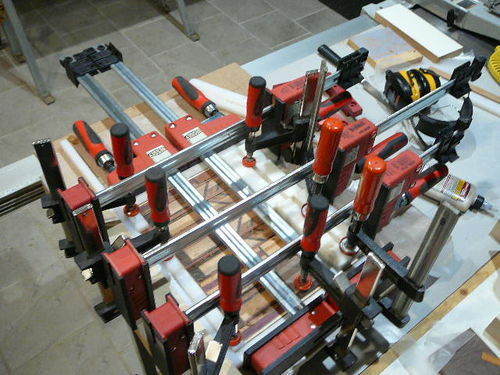 It also made the process of fitting the other pieces easier. Once the trial pieces looked good and fit well, all of the copies were completed. 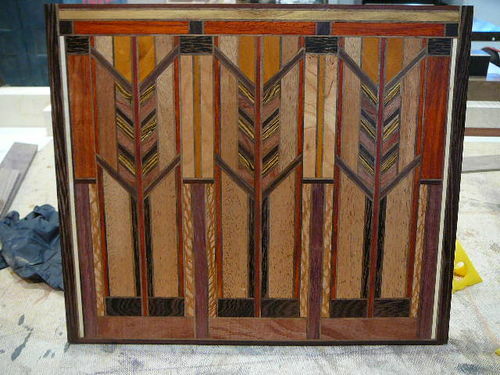 Make sure to count the number of similar panels (and pieces) and keep track of how many you need and how many you have. Part way through cutting and gluing the diagonal pieces I realized I was only making enough panels for 1 mosaic and I needed two. Fortunately, I had cut some extra strips and was able to catch up on the second panel. 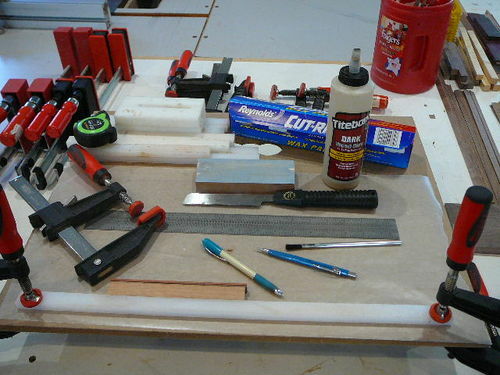 Making the component panels takes some forethought and planning. 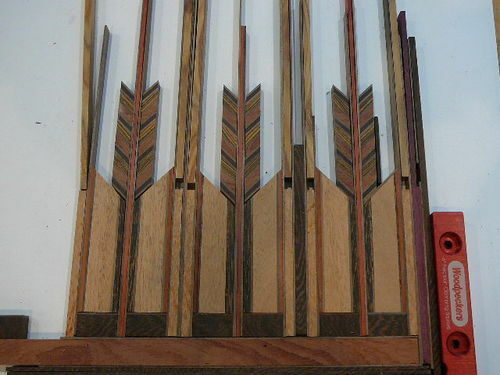 You don’t want to wind up having to cut and glue little pieces. It is messy, the pieces don’t fit well, and it is also very time consuming. Here’s an example. 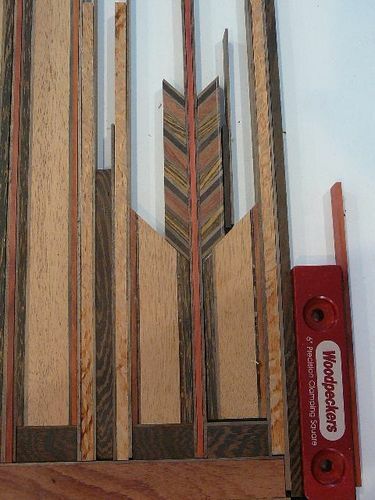 I precut the width of the paduak and katalox pieces for the top of the mosaic. 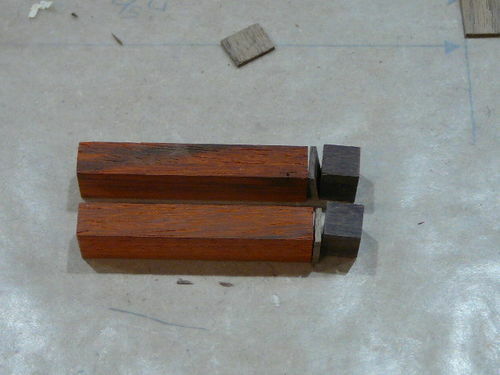 Then, I had to cut small walnut spacers to go between them. 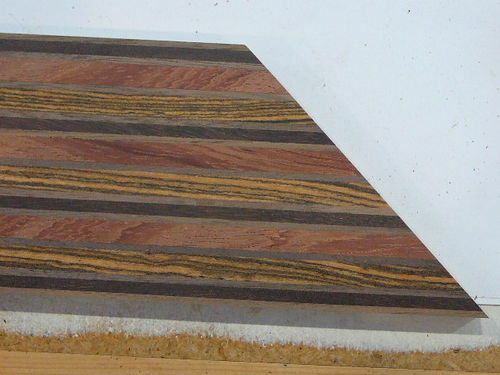 After cutting two of these I decided to use a wider piece of paduak, glue the walnut spacer and katalox to it, then rip the pieces to width after the glue dried. 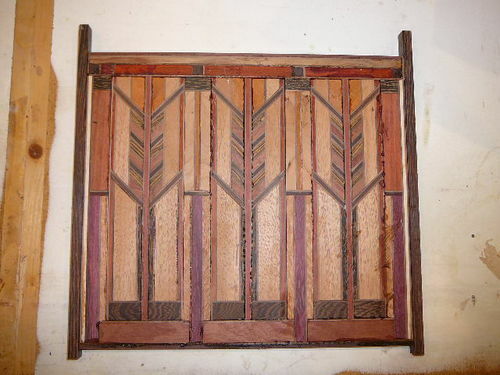 Here is an example of the pieces for the upper diagonal panel. 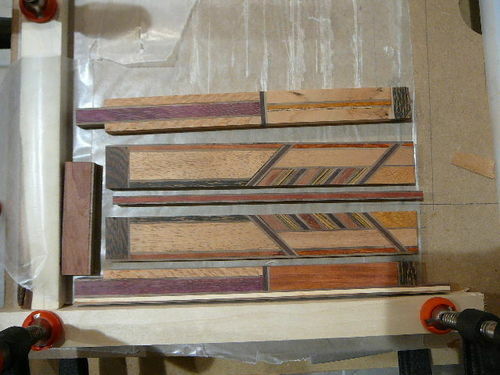 The blocks were glued diagonally to another glued up strip of katalox and walnut spacers.. However I didn’t leave enough extra length on the spacer. When I slid them into place, there were holes at the point where everything came together. So I had to cut the katalox strip off and start over. 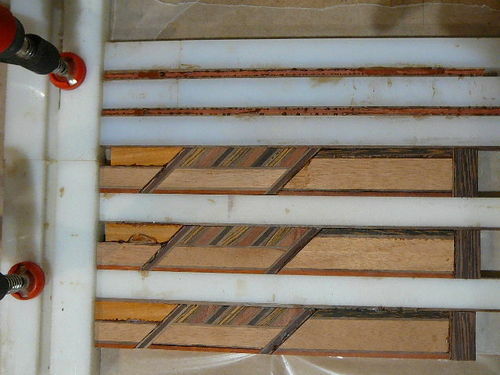 From there, the top and bottom diagonal sections were glued together to make a complete vertical panel. 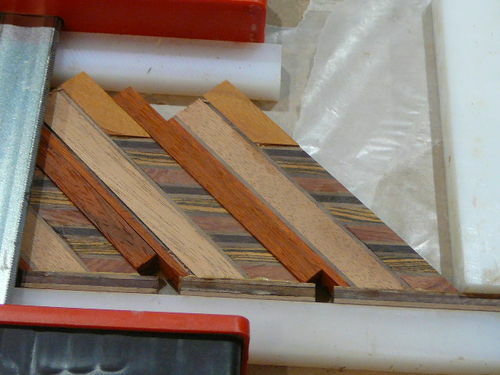 Before gluing, the panels were very slightly trimmed to provide a straight side for a better glue-up. The ends were also squared up and the excess portions were removed. Hopefully, I remembered everything. Post questions, comments, ideas, or suggestions. Lots of patience and even more bench space are key requirements, it seems. Thanks for walking us through the process! Earl, thank you. It is very informative and educational. And yes, huge respect for the patience! Now that some beautiful work and love seeing how you got er done! WOW!!! Nice to see the process and how it all comes together. Thanks for sharing. This work is awe inspiring. Thanks for sharing the process.